Photo: Momokawa from SakéOne, Oregon-made sake. I first tasted sake, like most Americans, in Japanese restaurants which served standard Japanese restaurant sake. I drank it, as they served it to me, partially boiled to death and I thought it grand. After those early sake experiences in college, I lived in Japan on two separate occasions, most recently from 2005 to 2008. I had a chance to educate my palate a bit. The great stuff, Japanese artisan-made sake, inspires a delightful awe and a reverence for craft. That frank delight in the drink is reflected in the missionary work of people like John Gauntner (see Sake World), Beau Timkin at True Sake, and in some of the blogs I list at the left of this page, Tokyofoodcast and Jumanai Djimi Django, among others. The great sakes can encompass a wide range of styles and flavors, but they all are exciting, thought-provoking, and create good cheer. I had previously written here about how expensive sake is in the United States, compared with prices in Japan. I knew there were American-made sakes that were much less expensive. So I bought a bottle of this $12 Momokawa with a touch of hope. Would I find a delicious inexpensive sake? Can they make good sake in America? For me, the Diamond was a startling disappointment. The nose was a bit gluey with some fruit, like funky cantaloupe. This got me excited at first because a cantaloupe nose is something that does appear in many great sakes. But then the texture on the palate was flat, with no brightness or complexity (and it didn’t improve on subsequent tastings). It disappears off the tongue with a note of sweet and sour alcohol. 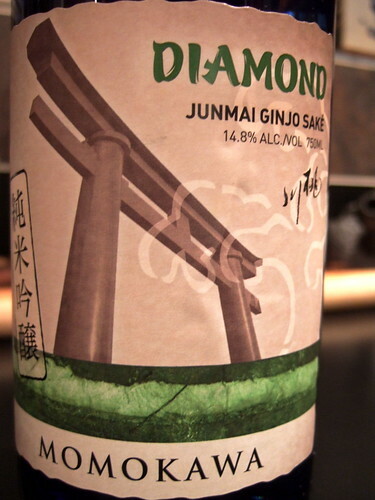 It has the body and underpinnings of good sake, such that one can tell it was made with love and some craft. I just don’t think it’s the best expression of what sake can be. “We represent the American taste bud,” said Greg Lorenz, who is responsible for the production of the sake. He studied sake brewing with SakéOne’s Japanese business partner, Momokawa Brewing, but uses his own inventive style to produce American sake. “I grew up on burgers and fries, not sushi and rice, so we’re going to make choices that seem appropriate based on our background,” he said. ETA: See the post on the second tasting of Momokawa Diamond and a new tasting of Momokawa Silver thanks to SakéOne. I’ve heard this comment about sakes being designed for the “American palate”, alarmingly, from a number of Japanese brewers as well, and I really don’t know what that means! What is it? For my part, I really didn’t care for the g-sake, and I must say that I preferred the Momokawa Diamond of 5+ years ago to that being made today. I’ve never had the Diamond before so I was just going into it blind. My “American” palate likes excellent Japanese sakes. I’d love to hear what John Gauntner would have to say about brewing to an American palate. I’ve never tried Diamond, but I really wonder if there’s that much difference in “palate” between American and Japanese. This is what is interesting: is the brewer saying “palate” as in generally preferred tastes of the average American or “palate” as the idea that Americans actually taste things differently than Japanese. I can believe that the average American might have certain preferences cultivated over time based on standard foods one might eat in America versus in Japan. But I don’t believe at all that a person of any nationality with an educated sake palate (having tasted hundreds of premium sakes) would taste sake in a different way than a Japanese person. So, it makes me think the phrase “American taste bud” might mean brewing to the lowest common denominator, trying to be popular versus trying for the exquisite. I don’t know. I have to taste more American-brewed sakes. Like Pinot Noir from Burgundy compared to that of Oregon, or pizza from Venice to that found in New York, a crafted food or beverage will most certainly reflect it’s place of origin and those who crafted it. As was noted, “…great sake can encompass a wide range of styles and flavors…,” we’d only add that for saké to be successful in America it must appeal to an equally wide range of tastes and expectations. To say our saké is brewed to an “American Palate” is probably oversimplifying, maybe complicating, our intent – to brew saké for America. Our focus at SakéOne is to always brew the finest we can with the ingredients and tools available to us. From the traditions and recipes shared with us by our Japanese teachers, we consistently evolve our abilities and seek to enhance our saké styles. Our only real limitation is the rice strains grown here in the States, but we’re working on that as well. Keep your glass ready because our sakémaster and his team are currently making great strides that will take our saké flavors, body and overall quality up many notches in the coming months. It’s an exciting time for this American brewer. explore. Please email your shipping address to dewey-weddington@sakeone.com. Dewey, I’ll take that offer! Thanks so much for writing and clarifying your take on some of these issues. You are very welcome. I’ll watch for your email and send those right out. Please stay in touch and don’t be shy to reach out with any questions or comments.